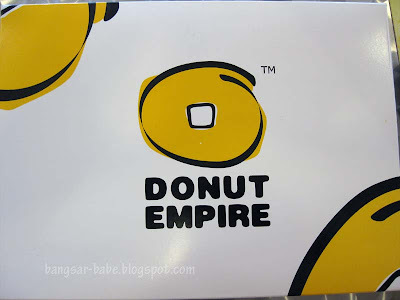 Donut Empire – Every bite rings a moment? There are times when I put myself (or more like my mum makes me) through a strict eating regime, which comprises rolled oats, celery & choy sum juice, organic vegetables and free-range eggs. 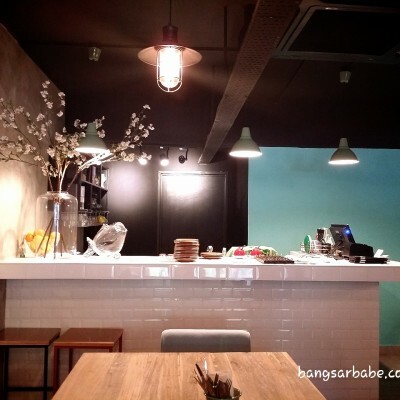 And there are times I indulge in greasy food followed by desserts – the sweeter, the better. 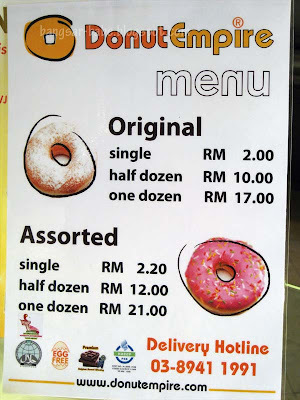 I was at Pusat Bandar Damansara picking up some wine at a nearby supermarket, when rif and I spotted this donut outlet with no visible name. Curious, we peered into the window stand and saw an array of decent-looking donuts on display. 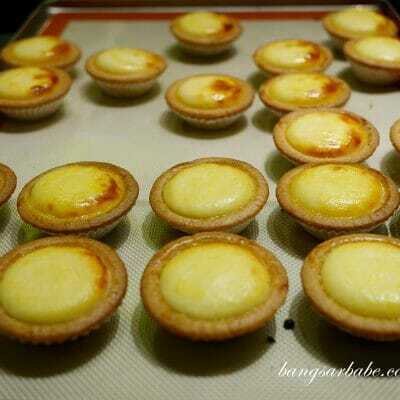 Being the curious cats we were, we bought half a dozen (6 for RM10) to try. I noticed a few people in the shop surfing the net — so I’m assuming there’s free WIFI. Tastewise, I was not impressed with the donuts at all. 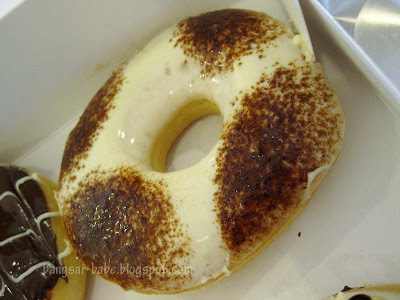 They were a far cry from the donut kings — Krispy Kreme, Big Apple & J.Co. Firstly, the donuts were neither light or cake-y. I found them to be denser than the ones I usually eat, but not as dense as Dunkin Donut. While they tried hard to impress with colourful toppings & pipings, I wasn’t sold. 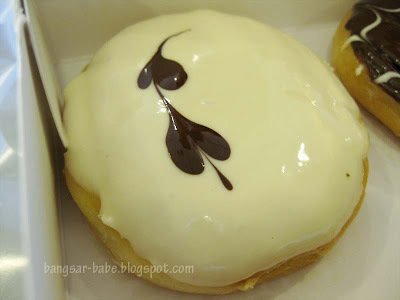 The white chocolate glaze tasted like palm oil and was overly sweet, in a cheapo way. 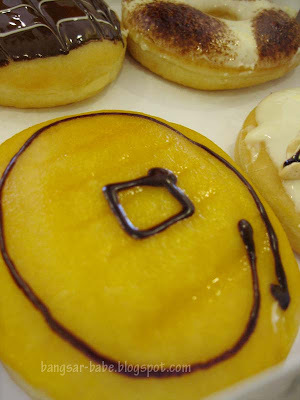 This was a sorry attempt to mimic the mango flavoured donuts from J.Co & Big Apple. I really didn’t like the mango custard — it was all sugar and flavouring. Of the lot, I liked this best. 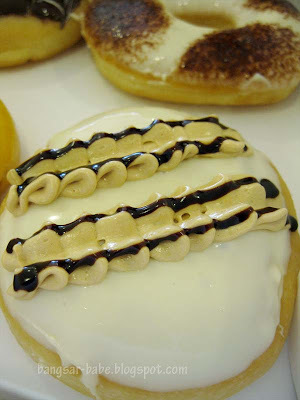 The latte cream filling helped mask the unpleasant taste of the white chocolate, so I tasted more coffee than chocolate. I wouldn’t mind having this again, if I’m desperate and there are no other options for me. I thought this donut looked pretty, but it tasted disappointing. They claim the chocolate is premium, but I seriously doubt it. This tasted like the cheap cooking chocolate available at supermarkets. No to this as well. I found the filling more cream then cheese — you know those plastic tasting whipped cream from the can? Imagine THAT with a mild cheese flavour. 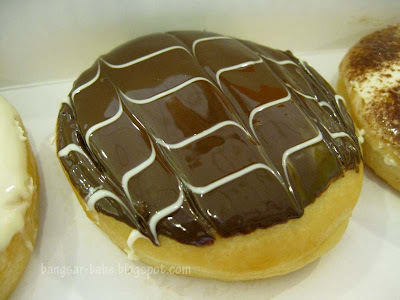 By the 4th Donut, we were struggling to finish this. This was better than the T’Misu, but I still found it on par (or slightly below) with the donuts from local cakeshops. I don’t think I’ll eat this again. The donuts are not good enough to justify the extra inch on my tummy. So…back to their tagline “every bite rings a moment”. Uhhhh…not for me! 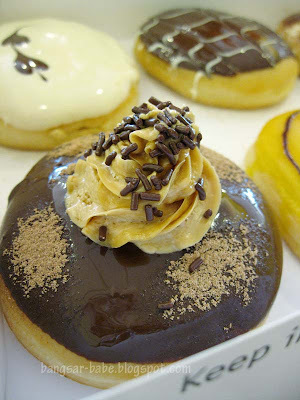 Verdict: Do yourself (and tummy) a favour and stick to the other famous donut chains. oh dear, nothing worse than getting stuck with all those unwanted calories! will banned this in my list then..
nah … this one ciplak one. think saw this in some jusco outlets back then. personally, i'm all for Big Apple. even more than JCo and Krispy Kreme. I went back to Danau Desa for Korean, but the one on the other end..on top of a convenience store… I thought it was better! At least the side dishes and the pork belly. I had 4 Korean dinners last week.. Can you believe it? luckily i didn't try it when i saw it in Tropicana City mall. peachesandcupcakes – Don't bother with those donuts. Really a waste of stomach space. ai wei – It was dreadful. Stick to big apple! YuhWen – Nak Won is it? I've heard about it too…we should do lunch/dinner there soon! taufulou – Nice meeting you that night! Sorry ah…had a lot of things on my mind, so I might have seemed a bit "drifted".